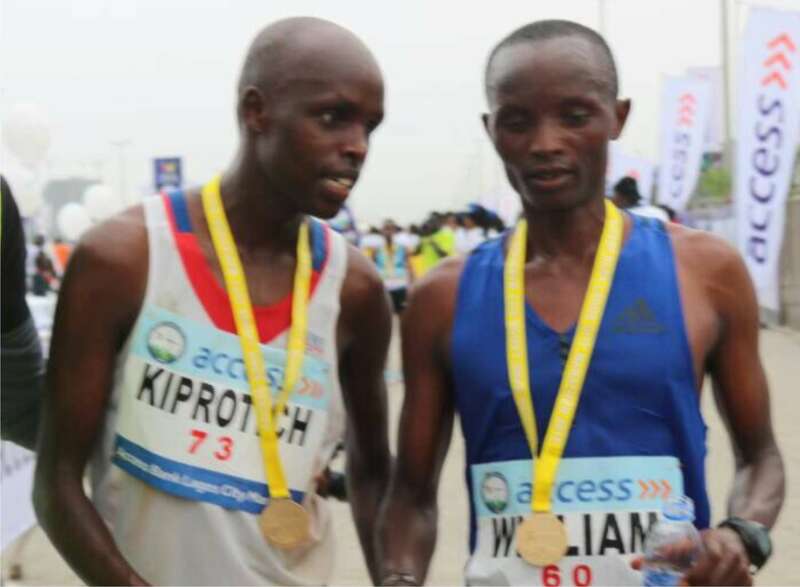 Abraham Kiprotich, Kenya-born French long-distance runner, has won the third edition of the 2018 Access Bank Lagos City Marathon 42km race. The 32-year-old finished in 2:13:04hrs to emerge the winner on Saturday, carting away the grand prize of $50,000. 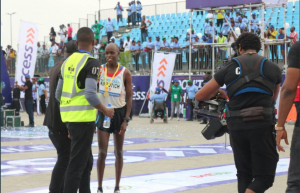 Abraham’s time set a new Lagos Marathon record, three minutes better than the record set by his fellow compatriot, Abraham Kiptum in the second edition of tourney held last year. 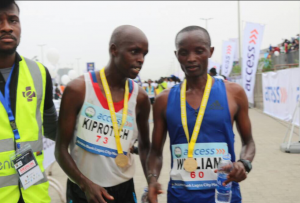 Kenyan duo of Ronny Kipkoech Kiboss and Benjamin Bitok came second and third finishing in 2:13:23hrs and 2:13:29hrs, winning $40,000 and $30,000 respectively. 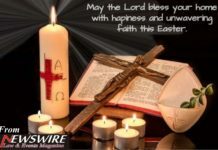 In the female category, it was a clean sweep by Ethiopia as the trio of Alemenesh Herpha Guta, Tigst Girma Getayechew and Ayelu Abebe Hordofa came first, second and third to win $50,000, $40,000 and $30,000 respectively. 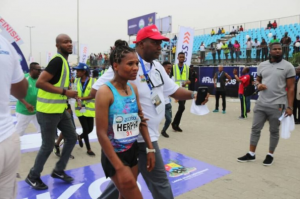 Iliya Pam was the first Nigerian to finish the 42km race in 2:40:19hrs to win N3m; while Sharubutu Philbus came second in 2:54:16hrs to win N2m and Kefas Williams also got on the medals table finishing third in a time of 2:58:1hrs to win the third prize of N1m. 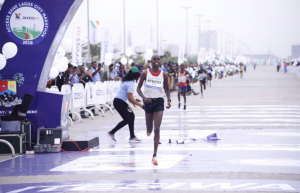 There were also prizes for Nigerians in the newly introduced 10km race, which saw Sajo Ismaila (male) and Ona Salay (female) drive home a brand new saloon car each and other mouth-watering prizes. 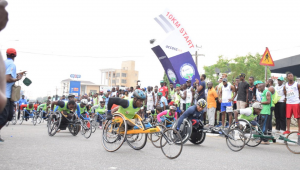 The 42km race started at the National Stadium, Surulere by 6:30 am and ended at the Eko Atlantic City in Victoria Island, while the 10km race also began from Osborne and terminated also at the Eko Atlantic City with over 100,000 athletes battling for the various prize monies. 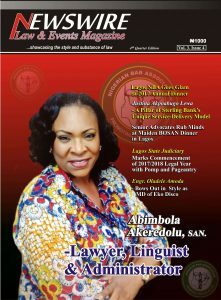 Despite the downpour in most parts of Lagos, participants in the competition came out in their numbers. 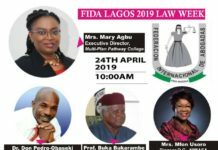 Austin Jay-Jay Okocha, a former Super Eagles Captain and Olumide Oyedeji, former national basketball team Captain, D’Tigers, praised the organisers for the initiative. 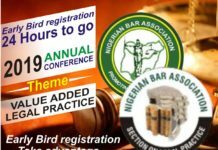 Okocha said that the event in which more than 100,000 participants are featuring, was a plus to the development of sports in the country. He noted that an event of its magnitude would always attract the world to the country. “I am here to support the event as well enjoy myself,” he said. 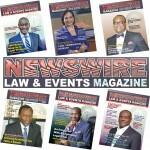 Oyedeji said that such an event was vital to sports growth and the physical wellbeing of the participants. 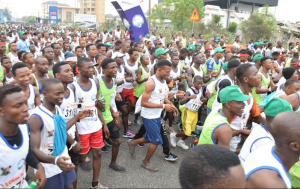 He added that the marathon at which over 208 dollars were on offer should be replicated in other parts of the country to engage youths. 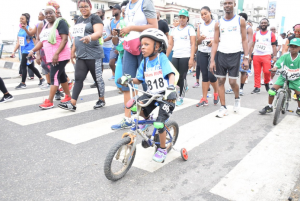 “Many youths are involved and it’s a way of engaging them,” he said. Security personal were on ground to ensure a hitch-free event. 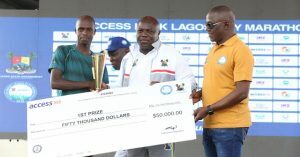 During the prize presentation, Akinwunmi Ambode, governor of Lagos, set a target for Nigerian athletes. “We want to get it to the Gold level, in the next two years,” he said. East Africans have been dominating the competition which has had two previous editions. Dignitaries who graced the marathon include Minister of Sports, Solomon Dalung; his counterpart in Information and Culture, Alhaji Lai Mohammed; representative of Chief of Army Staff, Major General David Amadu; General Officer Commanding 81 Division, Major General Enobong Okon Udoh; President of Nigeria Football Federation (NFF), Amaju Pinnick; ex-Super Eagles International, Austin Jay Jay Okocha; British High Commissioner to Nigeria, Mr. Paul Arkwright among others.